We love to eat good food. What about Indonesian food? Well, born and raised in Indonesia as Indonesian, of course I do love it. The thing is, I was born and raised in Yogyakarta. Since I took my bachelor degree in Universitas Indonesia, Depok, thus I have lived in Jakarta for 5 years. However, there are still many places in Jakarta that I haven't discovered yet, so does the place to get good food. If I have expat friends ask me about a good place to eat, I surely want to take them to try Indonesian food. Another problem is that I am sometimes clueless about the best place to get them. I just stumbled upon a website, named Burufly (www.burufly.com). It is a social travel website, that helps travelers to go find inspirations and places to go in Indonesia. 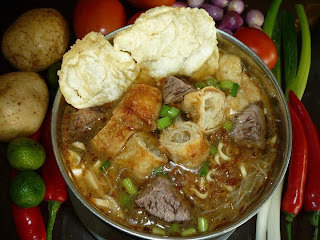 There I found an article 'Jakarta's Best Local Cuisine' that's very inspiring and helpful. Though in recent polls by CNNgo.com rendang was voted as the numero uno in the World’s 50 Most Delicious Foods, the wider array of Indonesian food is still very much “off the radar” and among the least known of major Asian cuisines. You might more familiar with Vietnam’s pho bo or sushi from Japan, but when the waiter in Jakarta offers you gado-gado or soto betawi, you might raise your eyebrows and ask further explanation about those dishes. What Indonesian dish do you most want to try? Or do you already have a favorite? We enlist 9 restaurants in Jakarta where we guarantee you to have a good time savoring the taste, presentation, and ambiance. Some might be considered as pricey while others promise a unique yet simple gastronomical experience that might end up being the highlight of your journey in Jakarta. This premise combines heritage and taste splendidly. Real antiques adorned the old Java décor, while the food is artfully presented inside a giant seashell or traditional pottery. Open for lunch and dinner, Lara Djonggrang (a legendary beauty who believed to be the one responsible for the creation of Prambanan temple in Central Java only in one night) might be the only place in Indonesia where you can have food that was inspired by Majapahit court culinary bonanza. Indonesian food served with international manners, everybody loves how Bunga Rampai (or flower bouquet) presents simple food but using the highest quality ingredients. Set in a Dutch colonial home and lavishly decorated with beautiful furnishings and flowers, this is the best place in Jakarta to dine in style. We recommend you to try the yummy Putik Sari Dua Rasa (fried strips of chicken and dory fish). We mentioned rendang earlier, so of course we have to put a Padang restaurant in our list! You will find many Padang (the capital of West Sumatra) restaurants in Jakarta but we pick this humble premise for your enjoyment... Located in the heart of old Chinatown, they serve authentic dishes that are praised by many, from rendang, spicy chicken, to fish curry. As you sit in, the table will quickly be set with numerous small platters filled with highly-flavored and often spicy food. You eat what you like and get charged only with what you consumed. This is not a beauty parlor per se, but a place where you can appreciate Manadonese culinary expertise. 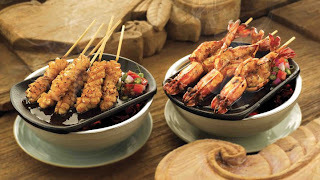 This style of food is greatly influenced by seafood,.. In here you can taste mackerel or tuna fish, roasted or sautéed. The food here can be very spicy so be careful to what you order. If you have more adventurous appetite, we dare you to enjoy paniki, the tasty grilled little bats! Vegetarians will love this place as they are famous for their salad. Gado-gado is a mixture of several kinds of steamed vegetables and peanut sauce. You can add some spices for more flavors though. This eatery might lead you to other finding such as tempe (soybean cake) and krupuk (crackers). Gado Gado Boplo is great for delivery, so if you are in your hotel room and tired of the boring room service, dial them up. With many branches around the city, you can spot this restaurant easily. This place is famous for its sate or satay, grilled meat or chicken served with peanut sauce. Sate Khas Senayan also serves other famous dishes from Indonesia such as nasi goreng (fried rice), ayam goreng (fried chicken) and traditional soup that are worth a try. You should also try Tahu Telr, a delicious and sweet savory dish. For the dessert ask for mango juice, probably one of the best mango juices in town! This eatery can be pretty difficult to find as it is located off beaten track somewhere in Kebayoran Baru, but definitely a must try. The passionate owner dedicated himself to find delights from broad parts of Java such as nasi toek toek, nasi rembang and soto gombyang. He uses only best produce and moreover, the price is amazingly low for such quality. Don’t forget to check out the counter for sweet treats. Sundanese (an ethnic from West Java) are known to be slender and beautiful people. Much of this is associated to the fact that their style of food is very healthy. Sambara is a homely establishment that makes you feel like you are eating in the rice fields as you do in Bandung. Try pepes (steamed fish, meat, or tofu in banana leaf) or karedok (raw vegetables mixed with peanut sauce) and you will understand why Sundanese diet can be considered as unique and healthy. Jakarta is a multi cultural city and is strongly influenced by its residents with chinese heritage. The mixture of Indonesian and Chinese cuisine offers a certain flair, so we choose this meat establishment to bookmark your trip. This street food is famous for its meatball, served with rice noodles and thick broth, and seasoned with fried garlic, cilantro leaves and chili sauce if you want more flavor (and sweat). They are open in the afternoon and close just before midnight.